Notice how quickly race became part of this story? What made THIS case special? Less than an hour after the shooting, certain things about the gunman were already known. He was ‘middle-aged and white’. We also knew that he had asked whether the guys playing baseball were Republican or Democrat. And just like that, within the hour, the race of the attacker was part of the story. Is anyone asking WHY that was an important element of the story? Here are two pictures that represent two stories. The face on the Left was responsible for the shootings in the Pulse nightclub a year ago. 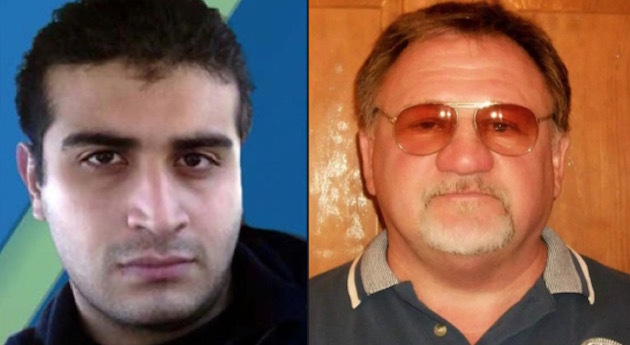 The face on the right was the shooter in Alexandria. We just passed the anniversary of the Pulse Nightclub shooting. Do you remember what happened there? Newspapers (and officials) tripped over themselves NOT to mention the fact that he was connected to a local Mosque. More than that, they went out of their way to paint him as a non-practising Muslim. This, despite the fact that Omar Mateen called 9-1-1 and pledged allegiance to ISIS. In Dallas, when a racist started shooting cops, people — including President Obama — tripped over themselves NOT to implicate his race. Maybe you remember one of the Wikileaks stories that showed just how dark the soul of the Democrat campaign team really is. There is a reason the Left will RUN for the opportunity to pin any violence on a white guy with racist motives. Actually, there are several. First, it helps push that narrative of Identity politics. The white guy is the villain in their story and he has to be for their story to hold together… or else they’ll notice that their identity politics narratives are mutually exclusive. Second, every white guy making an attack pads the numbers of their ‘white domestic terrorist’ storyline, which is used to paint any objection to Jihadis as merely ‘Islamophobia’. As you saw with the Clinton story, they actually CHEER when they learn that the bad guy was white. Third, the only race they can ‘safely’ report is the white guy. Otherwise, they face the possibility of being called ‘racist’ for introducing that element into the story. So, basically, it’s evidence of moral cowardice if they’re willing to mention WHITE skin, but no other color. If they must mention race, they tend to use euphemisms, like ‘Mediterranian’ Or ‘Asian’. Lastly, and most important — they are desperate to focus on anything OTHER than the IDEAS that drive the attack. They want it to be racism. Or gun ownership. Or mental illness. They won’t accept that it’s a hateful set of ideas that might be traced back to Islam or Socialism — even if it’s explicitly stated. Because that brings up hard questions they’d rather not ask. Here’s ONE podcast that isn’t afraid to ask them. Looking for someone willing to cut the BS and talk about the real issues? The ‘Warriors & Wildmen’ podcast is for you. Share if those are exactly the ‘hard questions’ we NEED to be asking.